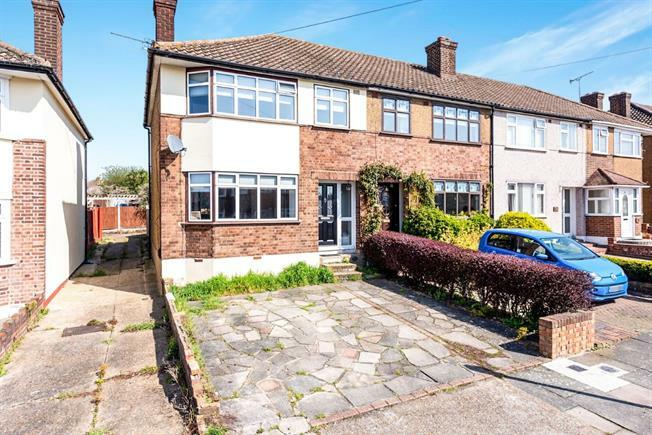 3 Bedroom End of Terrace House For Sale in Romford for Guide Price £360,000. Guide 360,000-370,0000 No Onward Chain. A Fantastic Family Home In Rise Park With A Through Lounge And Low Maintenance Garden. This fantastic property is ideal for commuting being on a direct bus route for Romford city centre. To the front of the property you have off street parking and rear access by foot. Once inside you have a great through lounge that in the near future could be ideal to reconfigure for a large breakfast kitchen or rear extension(stpp). To the side of the dining room is your well equipped kitchen with built in appliances. To the rear is your low maintenance garden with new fencing. Once upstairs you have two very good sized double bedrooms, your modern family bathroom and a good sized useable single bedroom.